Chronicle Books, San Francisco, 2015. 293 pages. Full disclosure: Clare Dunkle is a friend I met when I lived in Germany, and I love everything she writes. But I have good reason! Her writing is wonderful. 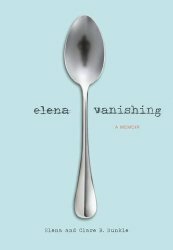 Elena Vanishing is a memoir, written from the perspective of Clare’s young adult daughter, Elena, about her years fighting anorexia nervosa. This was released alongside Clare’s book alone, Hope and Other Luxuries, which had the mother’s perspective about everything. I related to that book more, because I’m a mother, too. This book was more painful to read because Elena verbalizes the voice in her head that was saying awful things to her, fueling the anorexia. I have pages on my site for Children’s Nonfiction and Adult Nonfiction. I should perhaps separate out a page for Young Adult Nonfiction. As it is, I’m going to post this on the Nonfiction page, with the note that it is written for teens, from a teen’s perspective. It may be painful to read, but it does give the reader a better understanding of what it feels like to be in the trap of this life-threatening disease. Clare says in a note in the front that she thought she knew about anorexia nervosa. I had believed anorexia nervosa was about dieting to achieve a “supermodel” look. In fact, during Elena’s worst years, she never once looked at herself. Elena dieted because not eating was the only thing that brought her a sense of peace. Anorexia had so altered the pattern of her mind that following her into that inner world was like stepping through a fun-house mirror: everything I took for granted seemed to twist into something else. Most important, I had believed eating disorders were relatively rare. In fact, around ten percent of the American population will suffer from an eating disorder at some point — the vast majority of them while they’re in their teens or twenties. Now that I know what to look for, I see them everywhere. But this isn’t the story of anorexia nervosa. It’s the story of a person. It’s the story of Elena Dunkle, a remarkable young woman who fights her demons with grit and determination. It’s the story of her battle to overcome trauma, to overcome prejudice, but most of all, to overcome that powerful destructive force, the inner critic who whispers to us about our greatest fears. This is a powerful and eye-opening story about a difficult journey. This entry was posted on Wednesday, July 22nd, 2015 at 11:00 pm and is filed under Nonfiction Review, Starred Review, True Stories. You can follow any responses to this entry through the RSS 2.0 feed. You can leave a response, or trackback from your own site.